It’s actually quite a celebrated building, certainly the most well-known of the surviving Arrasmith terminals, so much so that architectural model company Chisel and Mouse makes a lovely little sculpture of it you can buy for your home (see here). 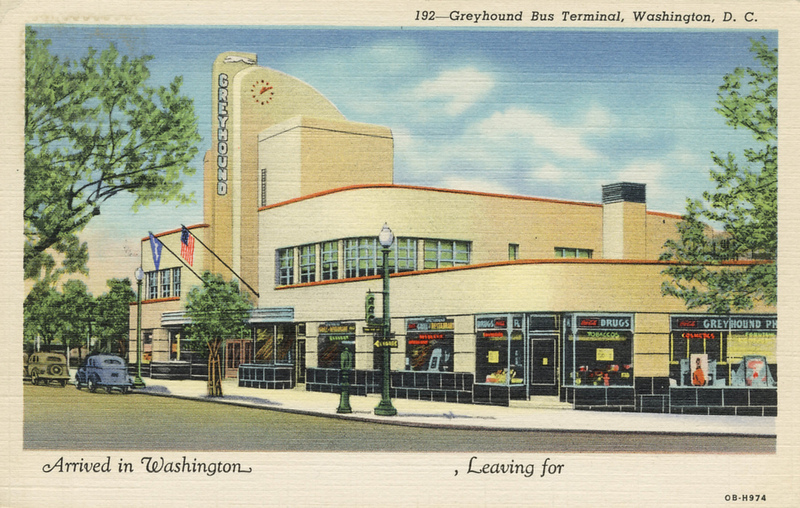 The Washington D.C. terminal opened the door for Arrasmith to become Greyhound’s chief architect for all its work in the east of America. Having developed a new limestone-faced style for his Greyhound terminals, further buildings of this type followed. The terminal in Buffalo (New York) opened in 1941. Like Erie, it was a small (but not quite as small) terminal, again squeezed onto an inconvenient and narrow site. Arrasmith’s design solution was virtually the same as at Erie, but with all the elements in reverse order. So the totem was at the right hand end of the building, again of a piece with the canopy, but this time in a reverse L-shape. Like Erie, the frontage was stepped down (but not backwards) halfway across, to give the illusion of greater size to the building, and there was a rounded end to the window run on the upper floor. One feature not seen at Erie is a highly characterful porthole window in the end of the building, which looked down onto the bus stands. Now the Alleyway Theatre, the Buffalo terminal’s heritage is a little less easy to discern, especially as it has lost its pylon. 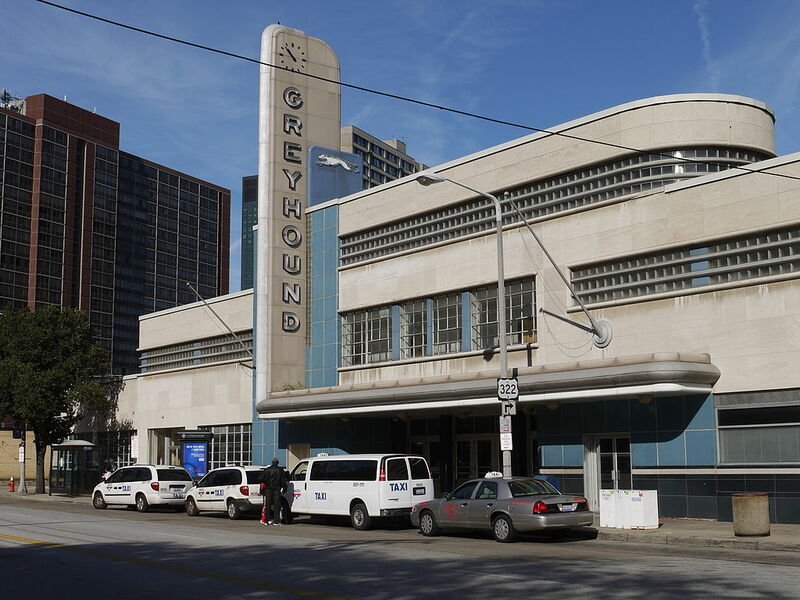 To my great annoyance, I walked past it last year and although I clocked the building’s Streamline Moderne architecture, I didn’t realise it was an ex-Greyhound terminal. I would have taken a photo of it if I had, but here’s one taken by someone else. A street beautification project in Buffalo has resulted in several trees growing up right outside the theatre, making it difficult to capture photographically, though the limestone facing comes across very well, as does the porthole window. What you can’t see is the canopy over the entrance which, like the one at Washington D.C., perfectly matches the Silversides bus. The theatre’s website has some photos of the building’s previous existence, here, which does show the canopy very nicely, as well as some of the polished metal fluting details on the building. 1942 saw the last Greyhound terminal to be built before America entered the Second World War, in Baltimore (Maryland), and it was another of Arrasmith’s. This was a larger building, though it was less streamlined than Arrasmith’s previous terminals. In fact, it bears more resemblance to the Post-war Modern terminals we’ll come to later in this article. Built on a corner site, the terminal is unusual in having a deeply recessed main entrance, which is situated at the corner. The overhang of the building’s upper storey is supported on a square pillar. Along with the totem and canopy structure, which wraps right around the corner of the building, the whole thing gives the impression of the upper storey floating above ground level. Gone from this building are the continuous runs of glazing, the windows here being placed individually with masonry between them. Also gone are any rounded ends to window runs or walls. All in all, it’s quite severe in appearance. It has long since been abandoned as a bus terminal but still survives as office/retail space. 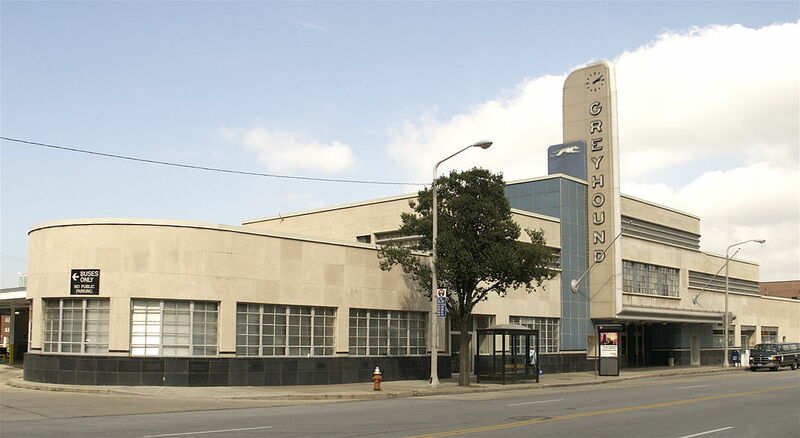 The first Arrasmith-designed Greyhound terminal to open after the war did so in 1948. According to one website with an interest in Greyhound terminals, the Daytona Beach (Florida) terminal was Arrasmith’s first post-war terminal, in 1947, but Wrenick (2007) doesn’t credit the Daytona Beach building to Arrasmith, so it’s difficult to know whether to include it here or not. I’m going to exercise caution, and instead press on with the first post-war terminal that everyone agrees is by Arrasmith, in Cleveland (Ohio). Greyhound and Arrasmith were back with a bang. This was to be no Erie/Buffalo small building on a narrow site. This was to be one of the largest, and most dramatic, terminals Arrasmith would design for Greyhound. As the Cleveland News (modestly) put it, “Greatest Bus Terminal in World to Open in City Tomorrow”. Arrasmith’s biographer Frank Wrenick (2007: p155) is slightly more restrained, describing it as “one of the most cohesively designed of Greyhound’s streamline terminals”. 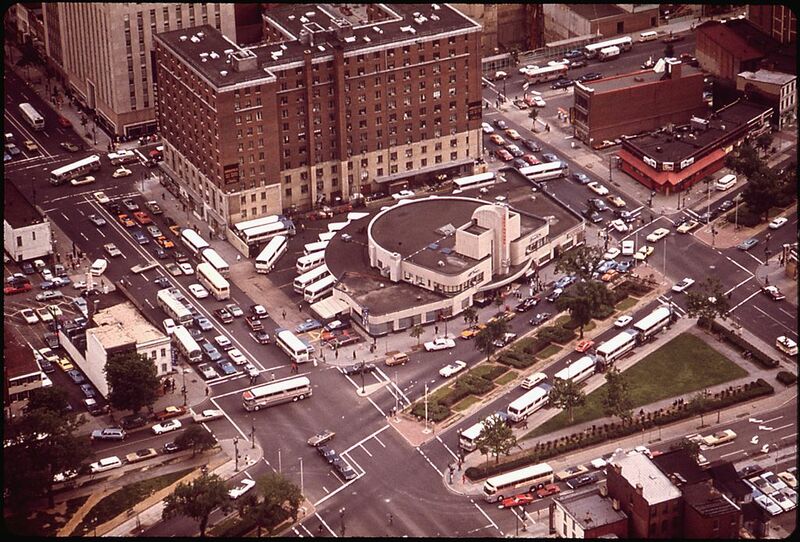 I’m more inclined to go with the former assessment, as it’s hard to think of any bus terminal which had been built up till that time which was as magnificent, inside and out, as Cleveland’s. It survives in use to this day, a testament to the enduring appeal of Arrasmith’s design. It’s a long, low, building when seen from the front. If you wanted to freeze in built form the sensation of a Silversides bus passing at speed, this is exactly how you would do it. The conjoined totem and canopy is present and correct, of course, but the long runs of continuous glazing are as wide and as narrow as was practically possible to give as much horizontal emphasis to the frontage as Arrasmith could manage. Inside, some of its original glamour has been lost behind later fittings which aren’t of the same quality as the originals would have been; the original benches were solid oak, for instance. But you can still see the quality of the underlying design if you look hard. The flooring design is original (the diagonal checkerboard pattern is typical Arrasmith), and there’s some lovely detail around the tops of the columns and the top of the restroom block. Despite its brilliance, it was the last of Arrasmith’s great Streamline Moderne terminals. 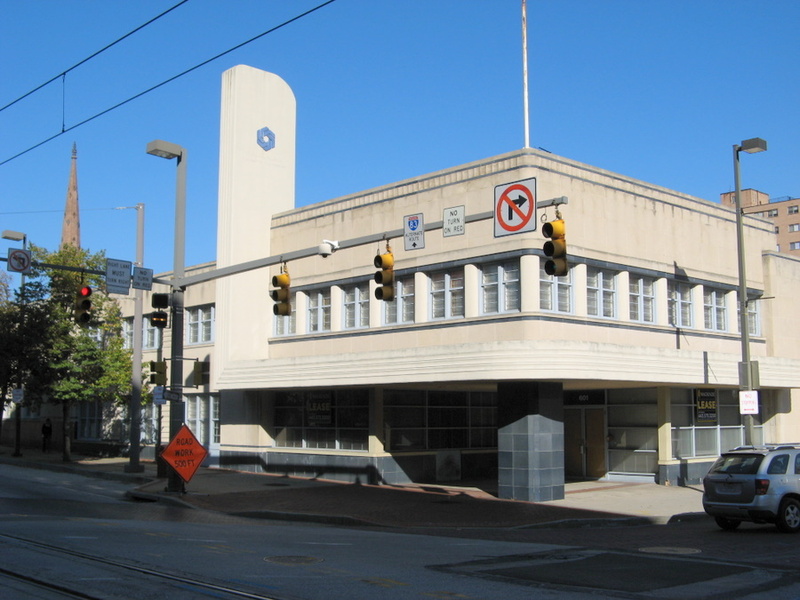 Architectural tastes had moved on and Arrasmith moved with the times (the Cleveland terminal had actually been designed before the war). The next terminal he designed was a Post-war Modern structure, every bit as attractive as his Streamline Moderne terminals, but lacking the curves which characterised his pre-war work, in favour of sharp corners and taller windows spaced more widely apart and no longer wrapping round the building. The finish of the facades changed too, and Arrasmith’s terminals were now generally faced with buff-coloured brick rather than smooth grey limestone. Some 20 other Post-war Modern terminals followed, initially of great style and presence, though more restrained than the pre-war Streamline Moderne terminals. As the 1950s wore on however, and Modernism became increasingly anonymous, Arrasmith’s terminals followed suit, and his last few buildings seem less celebratory of the coach travel experience than earlier works. That, perhaps, mirrored the rise of the private automobile in America; its explosive growth starting to replace trains and long-distance coaches as the travel mode of choice. Facing this changed environment, Greyhound changed its management, and the new personnel wanted a break with traditions of the past, Arrasmith’s work included. 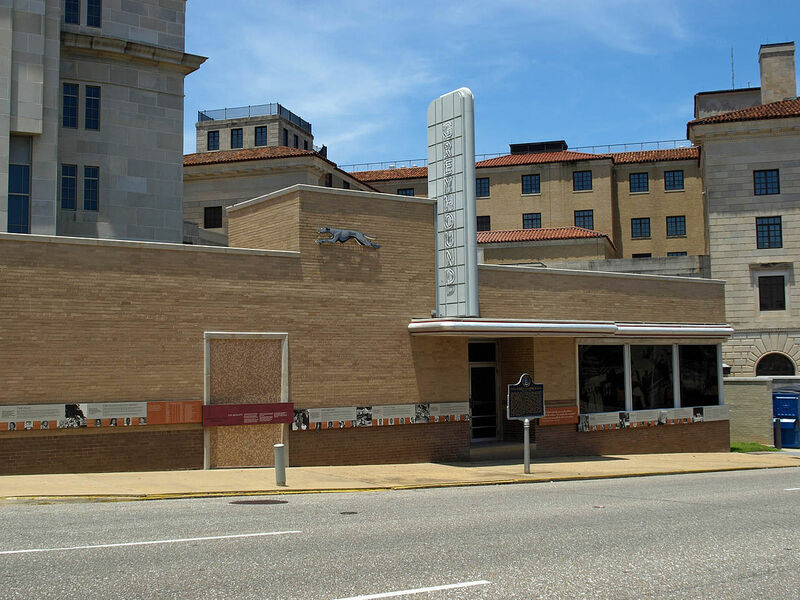 His last commission for Greyhound opened in 1960 in New Orleans (Louisiana). The Post-war Modern terminals were the most numerous type of terminal Arrasmith designed, and three survive. 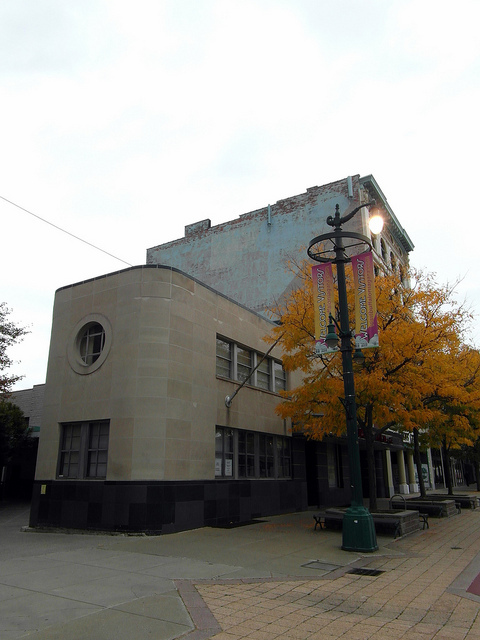 The first is in Lansing (Michigan), dating from 1950 and no longer in use for transport but instead as an office (again, spin the Street View around if necessary to see the building). It’s a medium-sized terminal that displays a lot of the typical elements of Arrasmith’s Post-war Modern work. It’s finished in buff-coloured bricks, and is strong on 90° angles rather than curves. 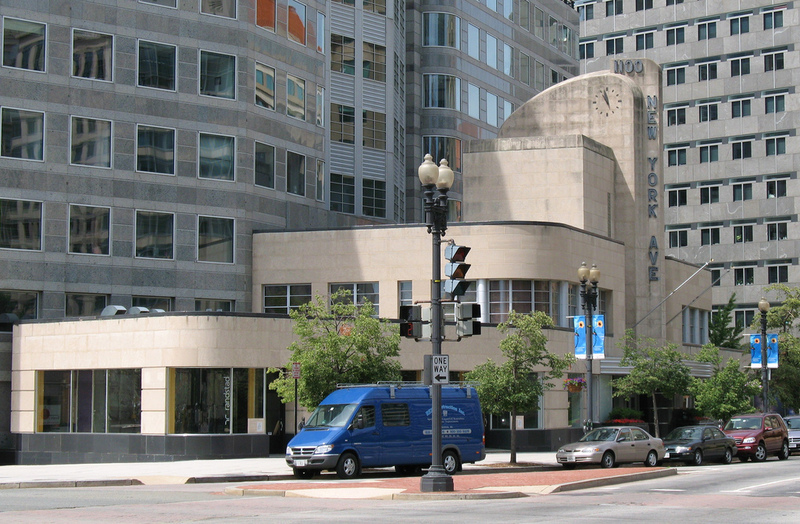 The flutings and flourishes that marked the Streamline Moderne terminals have vanished, with the exception of the totem and canopy, which retain some nice curves. But even here the two elements are discreet, rather than flowing one into the other. The small terminal in Montgomery (Alabama) opened in 1951. It would go on to play a key part in the American civil rights movement during the 1960s (more details here), as Arrasmith’s Jackson terminal also did. 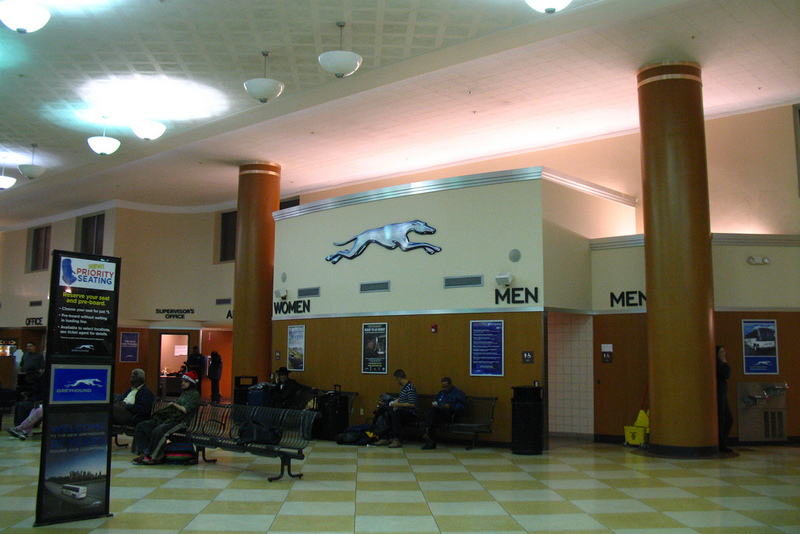 No longer in use as a Greyhound terminal, it is now a museum explaining its historical importance. It is faced with the typical buff-coloured brick of the Post-war Modern terminals, and it’s nicely proportioned, but it lacks the sheer on-street presence that most of Arrasmith’s other terminals have. Perhaps it’s the large expanses of plain, unadorned walls. This is arguably the most attractive Post-war Modern terminal that Arrasmith designed, and the last of his terminals to survive. The overall massing of the building is very effective, and it looks far more recent than its actual age of 64. Again it’s finished in buff-coloured brick, with a super clock and very smart porthole window (something of a hangover from the Streamline Moderne terminals; it can be seen on the far right of the building). The totem is not original – the original one was more curvy, and looked a bit like the one at Montgomery. Arrasmith wasn’t Greyhound’s only architect, although his scientific approach to terminal design marks him out as uniquely important to the wider history of public transport. There are a fair few other notable Greyhound terminal survivors, many of which employ the early Greyhound Blue style invented by Arrasmith. That’s an article for another time, though. Eleven terminals out of at least 50 remain to illustrate Arrasmith’s work, with three still performing their original role. 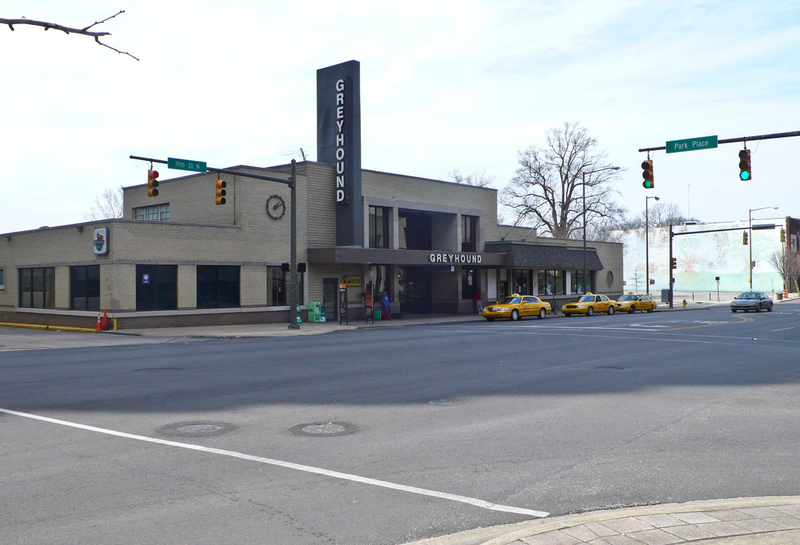 It’s not a brilliant survival rate, but those buildings tell the remarkable story of Greyhound’s relationship with Arrasmith, and the architecture that resulted from it. They enhance the streets on which they stand, and act as a reminder of the glory days of stylish coach travel. You can’t really ask for more than that. Bayer, Patricia (2011): Art Deco Postcards. Thames & Hudson: London. A number of visualisations of early Greyhound terminals can be found here. It was the gift of this book that finally provoked me into writing this article, which I’ve had on the slate for a long time. Thanks Dad. click here for Washington D. C.